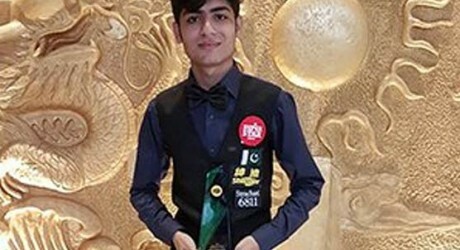 A Pakistani player, Naseem Akhtar won the under 18 World Snooker championship by defeating the Chinese player, Peifan Lei with the margin of 5-3. In the world championship, there were 48 cueists belonged to 29 different countries of the world. Two Pakistani players, Naseem Akhtar and Haris Tahir also participated in this big event. The two players played their group stage matches and they remained undefeated in these matches against their rivals of different countries. When they faced each other in the pre-quarterfinals, Naseem beat Haris with the score of 72-16, 7-67, 91-31, 69-45 and 63-24 in the frames. Pakistan Billiards & Snooker Association, the champion reached to the semi finals yesterday after beating Florian Nuble from Austria in the quarterfinals by 4-1 with the score of 62-67, 74-7, 86-29, 74-8 and 72-21. In the semi finals, he played the match against Amir Nardela of Israel. He won all of the frames against him by 4-0 and reached into the finals. These two brilliant players represented Pakistan in this great event and they played well during the entire event and Haris was also beat by his Pakistani player. Muhammad Yousaf also teaches the snooker to the new young players at the big snooker club, Dolphin Snooker Club located in Chandni Chowk, Lahore.